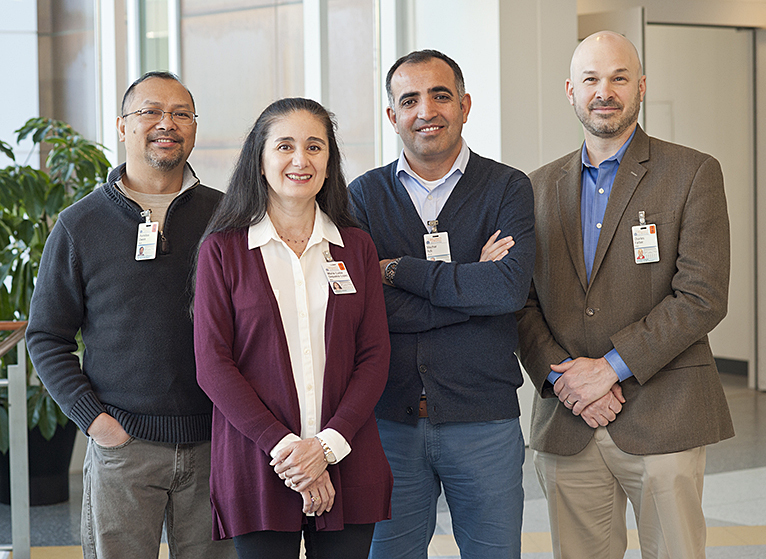 2019 Pinn Scholars: (l-r) Owen Pornillos, PhD; Maria Luisa Sequeira-Lopez, MD; Mazhar Adli, PhD; and Charles Farber, PhD. Congratulations to the 2019 Class of Pinn Scholars, who were named this December. Pinn Scholars are selected on the basis of their scientific expertise and contributions to the School of Medicine and to the greater research community. They are expected to develop a new project or direction in their research and share their results at an annual symposium. The Scholars program is named in honor of Dr. Vivian Pinn who was a graduate of the UVA School of Medicine Class of 1967. She is a member of the National Academies of Science, a fellow in the American Academy of Arts and Sciences, and past president of the National Medical Association. Previous Scholars include Alison Criss, PhD; Brant Isakson, PhD; Scott Keysell, MD, MPH; Gordon Laurie, PhD; Shayn Peirce-Cottler, PhD; Benjamin Purow, MD; Jeffrey Saucerman, PhD; and Jochen Zimmer, PhD. The new scholars will be introduced at the Annual School of Medicine Symposium on Research Excellence on Wednesday, Feb. 6, 2019, from 2-5:30 PM in the Pinn Hall Conference Center Auditorium. The symposium will feature the work of the first two classes, as well as some recent faculty recruits.